Ah, the Super 8! Some may scoff, but coated in dust and sweat after a couple days of hiking, with sore muscles, black fingernails, and a repelling stink rising from your body, it’s tough to top a hot shower at the Super 8 in Bishop. 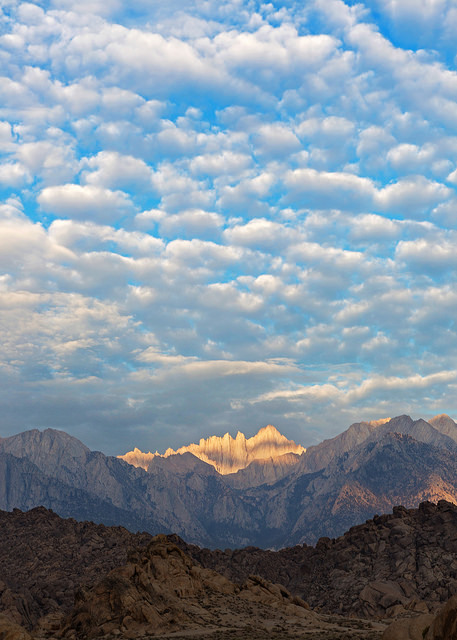 Tired but mostly whole again, I continued my string of early morning wakeups so I could down an Egg McMuffin at the Lone Pine McDonald’s as soon as they opened at 6am and still make it to the Alabama Hills by first light. 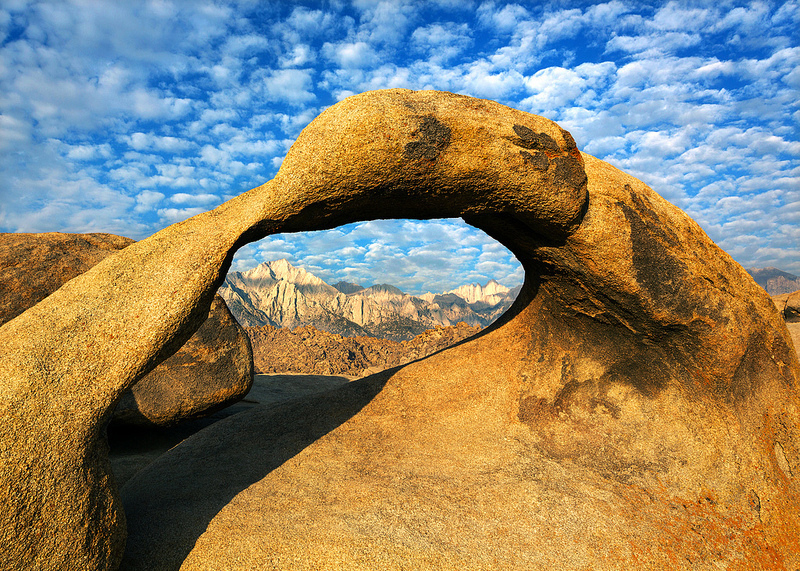 My target was the Mobius Arch, an artistically-shaped rock formation that perfectly frames Mt. Whitney and the surrounding peaks. 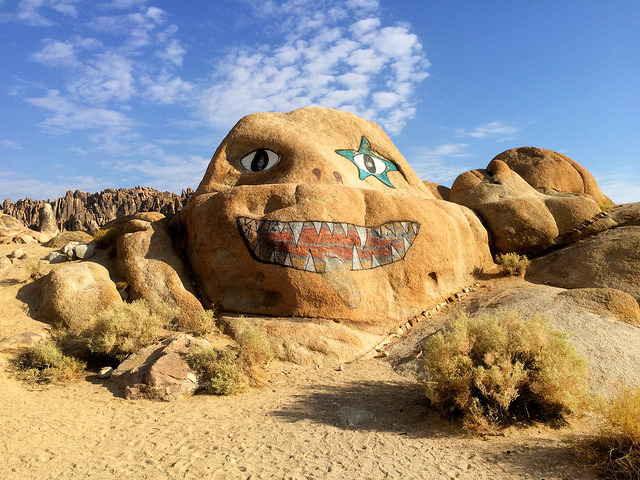 It’s only about 10 miles west of Lone Pine and I can’t believe I’d never checked it out before. 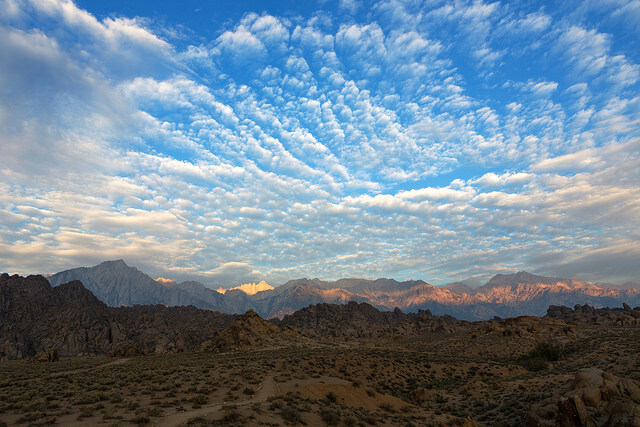 The dirt road leading to the trailhead is called Movie Road, apparently because so many movies have been filmed in the Alabama Hills. And I could see why. 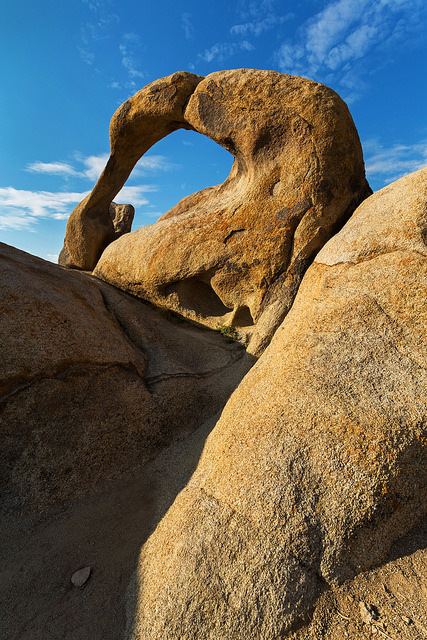 The landscape is beautiful and dramatic, a riot of unlikely rock shapes and patterns. Cottonball clouds made the sky more interesting that morning, and as I pulled into the parking area the first sunlight of the day began to hit the peaks. At one point the sun helpfully isolated Mt. Whitney with a hole-in-the-cloud spotlight. 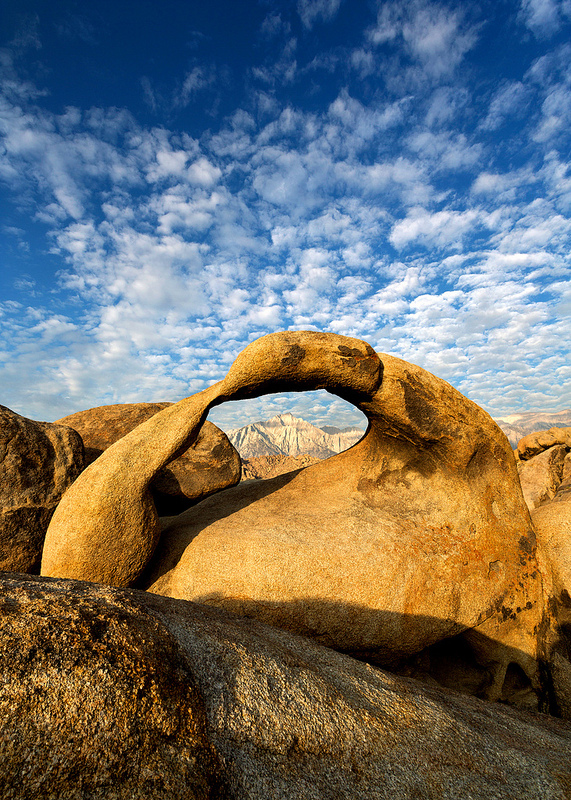 The Mobius Arch is only a fourth of a mile from the trailhead, and from the parking area I could see that I wouldn’t have it to myself. Thankfully I only had to share with one other person, a friendly photographer named Steve. “I’ve heard that sometimes there are lines of people here waiting to take photos,” Steve commented after we’d introduced ourselves. The arch looked even more impressive in person. It’s not particularly large, but the smooth, lightly twisted shape makes it unique. There’s something almost poetic about it. I felt cynical to think it, but I was impressed that the arch hasn’t been vandalized yet. I hadn’t even seen a single piece of trash in the entire area. Steve eventually left and I was blissfully alone. I took far too many photos and thoroughly enjoyed myself. Finally I’d had enough. I walked back to my car with a smile on my face and headed for Death Valley National Park, one of my favorite places. The layer of clouds intensified as I drove, which was a mixed blessing. It was great to get a break from the brutal sun, but direct sunlight makes the sand dunes in Death Valley much more interesting to photograph. The clouds persisted and I decided to skip the dunes this time. 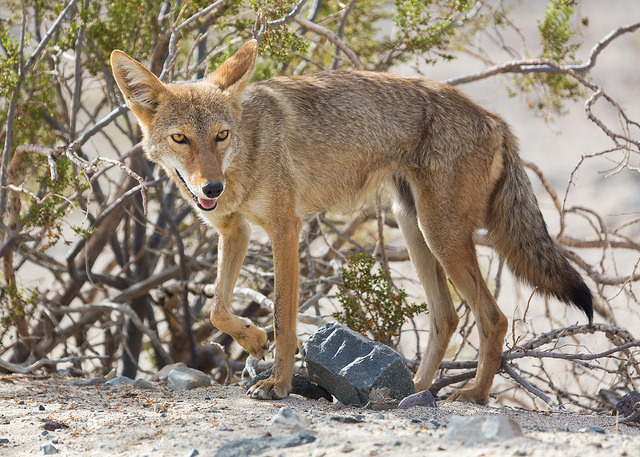 Another photo opportunity presented itself, however, when a pack of four coyotes appeared near the highway. 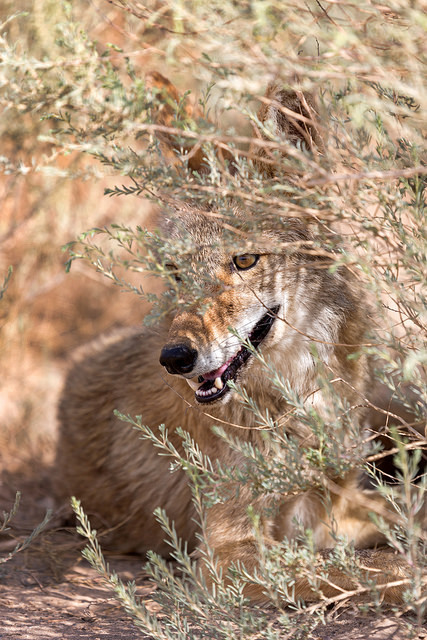 It reminded me of my first trip to Death Valley, when a lone coyote came right up to my car, apparently looking for a handout. Between Death Valley and Vegas I passed Creech Air Force Base and for the first time saw a Predator drone in flight. It looked pretty menacing, even from a distance. I wasn’t fast enough to get a photo. By mid-afternoon I was in St. George, Utah, where I spent the night. I planned an even-earlier-than-usual wakeup the next morning so I could be in Zion National Park in time to catch the first shuttle bus into the valley.